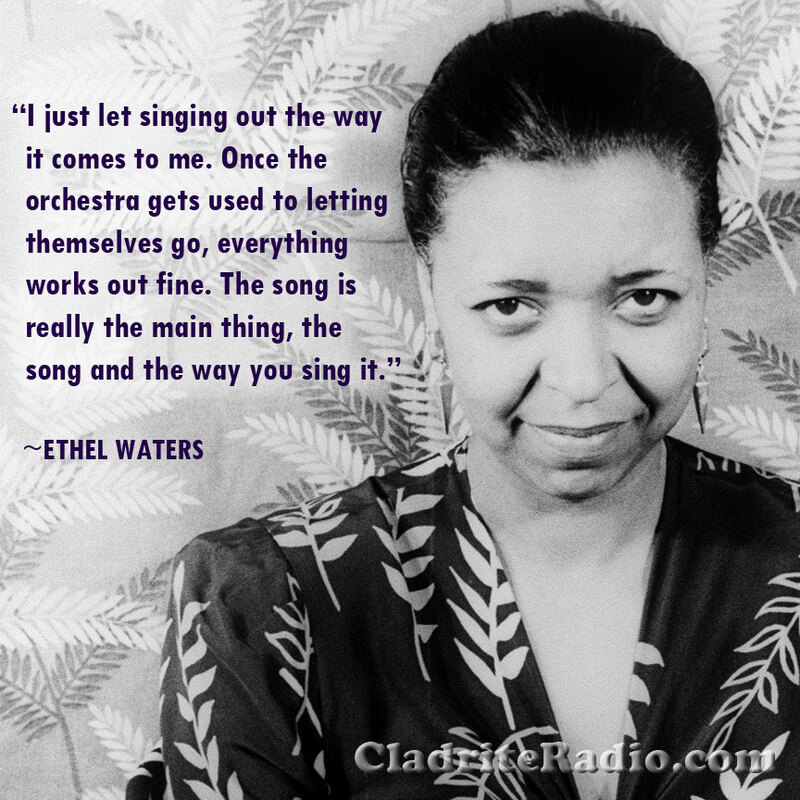 Happy 120th Birthday, Ethel Waters! Waters married at 13, but the man she married abused her and she left him to become a maid at a hotel in Philadelphia. When she was 17, she sang two songs at a costume party at a nightclub and was such a hit that she was offered work performing at the Lincoln Theatre in Baltimore. That engagement launched Waters’ career on the black vaudeville circuit. In Atlanta, she found herself working at the same club as blues legend Bessie Smith, who insisted that Waters not perform the same kind of music she was, so during their time on the same bill, Smith sang the blues and Waters stuck to popular songs. In 1919, Waters made her way to Harlem, debuting at a black club there called Edmond’s Cellar. In 1921, Waters became the fifth black woman to make a record on the small Cardinal label. 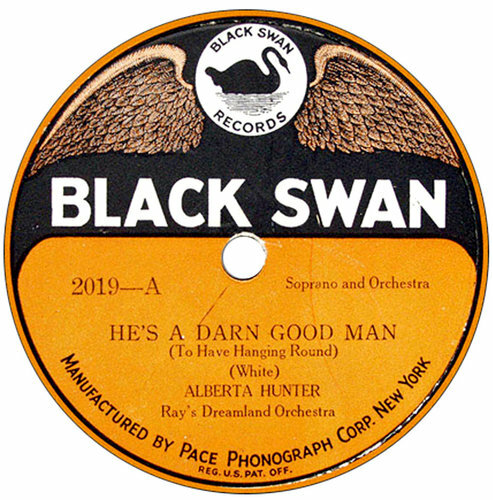 Before long, she moved up to Black Swan Records, where she recorded with Fletcher Henderson. In 1925, she signed with Columbia records, for whom she recorded the hit song, Dinah (in 1998, that recording was given the Grammy Hall of Fame Award, one of three such awards Waters’ 1920s recordings received). As her star continued to rise, Waters began to play “white” vaudevile on the Keith Circuit, which paid more and increased her fame. In 1929, Waters introduced the Harry Akst song, Am I Blue? It was a huge hit for her and became her signature song. In the early 1930s, Waters starred at the Cotton Club and appeared in Irving Berlin’s hit musical revue As Thousands Cheer; she was the first black woman to appear in an otherwise all-white show. In 1933, Waters was, thanks to her continuing nightclub work, her stage success and her national radio program, the highest paid performer on Broadway. In the 1940s, Waters’ career was on the wane and she experienced legal and health problems. In 1951, she wrote her autobiography, His Eye Is on the Sparrow with Charles Samuels. A later memoir, To Me, It’s Wonderful, established her birth year as 1896; she’d been lying about her age for some time in order to get a group insurance policy. In her later years, Waters began to focus on gospel music and spirituals, often touring with evangelist Billy Graham. In 1983, she was posthumously inducted into the Gospel Music Hall of Fame. Happy birthday, Ethel Waters, wherever you may be! Have you ever heard of the Black Swan record label? Neither had we (and it’s not something we’re proud of, given we’re all about pop and jazz of the 1920s, ’30s, and ’40s), but we were intrigued by Michael Pollak’s recent story in the New York Times and felt the Cladrite community might find it of interest, too. Black Swan was the first major black-owned record company. It managed to remain in operation for just a couple of years, but its influence was wide-ranging and long-lived. Black Swan was founded by one Harry H. Pace, a banking and insurance worker and disciple of W. E. B. Du Bois, who had previously paired with W. C. Handy in forming the Pace & Handy Music Company, a music publishing concern. 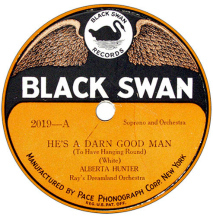 But Black Swan’s success led more established labels to realize what they’d been missing in not recording black artists, and in an effort to elevate the nation’s image of African-American performers, the label opted not to sign blues singer Bessie Smith to a contract. The label did introduce the likes of Waters, Henderson, Trixie Smith and Alberta Hunter, but after only two years, it was relegated to the dustbin of American music history. But during its brief existence, it had, as Pollak notes, awakened the music business, an impact that is still being felt today and for which we are all the richer.